That spontaneous improvisation proceeds flawlessly is a tribute to the musicians who play the music. 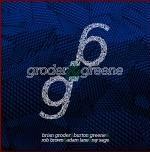 In Groder & Greene, a recording which brings together trumpeter and flugelhorn player Brian Groder with pianist Burton Greene, altoist Rob Brown, bassist Adam Lane and drummer Ray Sage, open-mindedness, musicianship and a salient responsiveness generates the stunning quality of the intuitive interaction among the group’s members. The music sets on an edge between boppish, sometimes dolorous, melody and coherent incongruence. In “Landfall,” the first track, Groder, Lane and Sage establish the groundwork before Greene sparks a dissonance that altoist Brown inherits, eventually becoming the lead horn. Such persistent instrumental shifting among all five players exposes the dynamic pervading the session. Distinctive characteristics arise, however, especially in “Amulet,” where Greene insistently clicks his false teeth percussion instrument and plays prepared piano to bring attention to the non-resonant aspect of its tonality. In his own “Hey Pithy, Can You Thropt The Erectus?,” Greene vocalizes gutturally and creates a raucous clamor to engage his partners in continuing a statement that portrays his radical non-conformism. Groder speaks with his brass instruments in untwisted lines, forever communicating their tremolodic brightness as well as their muted softness. Lane’s opening bass pizzicato in “Landfall” regales his extraordinary bent pitch sensitivity. Brown distinguishes himself with an essential vertical relationship to his alto. And Sage never fails, through a lightness of touch, to develop primary background textures. “Separate Being,” “Nigh,” “Surmised Wink” and the final “Sleepwalkers” demonstrate, with exquisite clarity, how each instrument comes to the forefront, plays against or aligns with the predominant tempo, in rare synchronicity, and then yields to another presents a patterned dimensional expression of instrumental personality. The direct improvisatory messages delivered in Groder & Greene are not easily forgotten.